What are waterproof training pants like? Waterproof training pants are step-in pull-on potty training pants that include a waterproof layer. They are specifically for use in containing potty training "accidents" while actively potty training your child with regular or child-led potty trips. Waterproof training pants usually have very limited absorbency and will only contain at best one pee. Usually the absorbency is not sufficient to keep leaks from escaping even at that. Waterproof training pants are therefore only appropriate for toddlers who are already mostly potty trained as "accident insurance". They cannot be used for nighttime diapering of day-potty trained children. Waterproof training pants are typically quite "poofy" and don't fit well under pants designed for use with disposable diapers. Most waterproof training pants do not have a way to open the sides to allow for changes without removing the child's pants and shoes or when poopy messes occur. So how do Antsy Pants™ compare to other waterproof training pants? Antsy Pants™ combine waterproof training pants' step-in donning with true diaper absorbency for pre-potty training use and the ability to increase absorbency for nighttime as well. Antsy Pants™ last two hours or more for normal wetters. 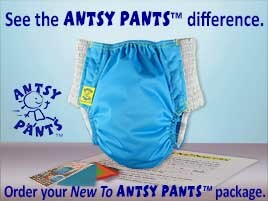 Antsy Pants™ are very trim and fit close to your child's body with no poufing. They fit more like a disposable diaper, so they go under famous-maker clothing with no problem. Antsy Pants™ have side openings that are there when you need them.